On September 7, 2017 the public was finally informed that more than 143 million Americans had their names, Social Security numbers, birth dates, addresses and some driver's license numbers exposed. After talking with friends, family, and fellow Internet patrons it turns out that most people just weren't sure where to start when it came to safeguarding themselves against the breach. So, what could I do to help? I set out to build a conversational assistant that could help people stay on top of their identity and lend a helping hand by offering suggestions on how they could handle the Equifax breach. Beyond helping people become more aware of how serious the breach was and what steps they can take to help reduce their risk, BreachBot was designed to offer a handful of helpful tips and suggestions for online security with his Security Checkup functionality. To start with, I focused on launching BreachBot on Facebook Messenger. With Facebooks recent push on not only with Messenger, but the chatbot industry in general, it seemed like a great avenue to quickly reach the target audience. Even though BreachBot was quickly gaining new users, it seemed to almost only be reaching tech savvy millennials, it became clear that it was time to release BreachBot to the masses through SMS. Within the first month of Breachbot being live, Breachbot acquired just over 1,000 unique users. 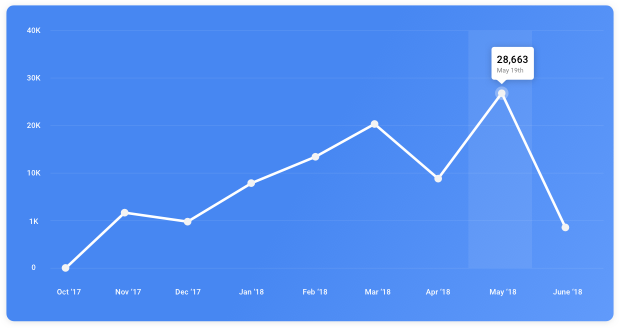 Weeks after introducing SMS capabilities into BreachBot, there was steady growth, while only experiencing minor dips in usage, over the course of the 7 months. During the 8th month of BreachBot being publically available, BreachBot hit its all-time high unique active user count of 28,663. BreachBot walked users through every step they needed to take to help reduce their risk from the Equifax breach, from freezing your credit to unsubscribing to pre-screen credit offers through physical mail. The Security Checkup flow was introduced and improved on to allow users to learn more about easy steps they could take to help increase the security of their digital life. The Security Checkup feature within BreachBot became the most widely used feature to-date. New features were regularly being added BreachBot, including 🚨 Breach Alerts powered by Have I Been Pwned? where BreachBot would automatically tell users when their collected Facebook email address was compromised in a breach. Over time, more major incidents were added into BreachBot to help give users more context around what happened, why it happened, and what they could do -- such as the Cambridge Analytica scandal with Facebook and the MyFitnessPal breach. In Q2 of 2019, BreachBot will be shutting down. This is a project that I am truly proud of & believe had a positive impact and those that used the service. The big digital world of today is a scary place & and hope that BreachBot or some future form of BreachBot can exist in the future. For the time being, I no longer have the time or budget to continue maintaining BreachBot & rather than have an outdated version of BreachBot out in the world that could potentially be giving users irrelevant or outdated information, I think it best to start the process of sunsetting. Thank you all for your support over the last year & for giving me the opportunity to feel like I was able to add a little good to this crazy world we live in.